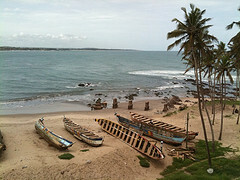 On Ghana’s coast, climate change is affecting ecosystem goods and services and leading to the loss of livelihoods. Unusually high ocean waves are destroying fishing equipment, as well as commercial and public infrastructure. Saline intrusion into freshwater systems is having a negative effect on fish breeding grounds. Despite negative impacts such as these, Ghana does not have a comprehensive development framework or policy to manage climate-related risks in coastal areas. As such, these issues are divorced from coastal zone protection. Decisions on climate risk reduction and planning are mainly top-down, and so lack the local content and ownership that would be necessary to lead to effective action on disaster risk reduction and climate compatible development at the grassroots level. This inside story, Building coastal resilience through an integrated approach: Lessons from Ghana, describes lessons learned from a CDKN innovation project that aimed to build resilience among Ghana’s coastal communities. The project used ecosystems- and risk-based approaches to integrate climate resilience measures into development. The initiative has sought to use the findings from these climate-vulnerable communities to inform climate-related risk management and contingency plans. This case study examines the lessons learned from this experience, and what it can tell development planners and practitioners elsewhere. A key challenge for climate compatible development and disaster reduction is integrating community knowledge and resources in planning at all levels. Multi-stakeholder engagement, effective communications and learning-by-doing all help deliver effective climate compatible development that builds coastal resilience in Ghana. Including the concerns of climate-vulnerable people in the formulation of research questions and the appraisal of objectives leads to local ownership, uptake and upscaling of research results. they require fewer resources to implement and are more efficient compared to external plans. To achieve coastal resilience, local concerns need to be addressed as a priority in policy formulation, and should be reflected in climate compatible development goals. Local concerns can be channelled from communities to district, provincial and national government, and this should be done outside of partisan politics.